Summers have started in full swing again and its time to switch our skincare routine to light and hydrating products which doesn’t clog our pores and lead to acne. Sunscreens are the most important and never skip it for God’s sake. But finding a good sunscreen for summers is a big task in itself. Most of the sunscreens leave a horrible whitish cast and when you are getting ready at top speed in the morning, you don’t want to take up the work of blending the whitish cast hundred times till it gets absorbed. And then there are other sunscreens which feel so heavy on your skin and you end up with clogged pores and acne. The last category of sunscreens are like Swamijis, they don’t do anything at all 😂. You still get sunburns and tan and they don’t seem to work despite claiming to have high SPF. But this summer, I think I have found my perfect sunscreen or sunblock. This stuff is really good guys! 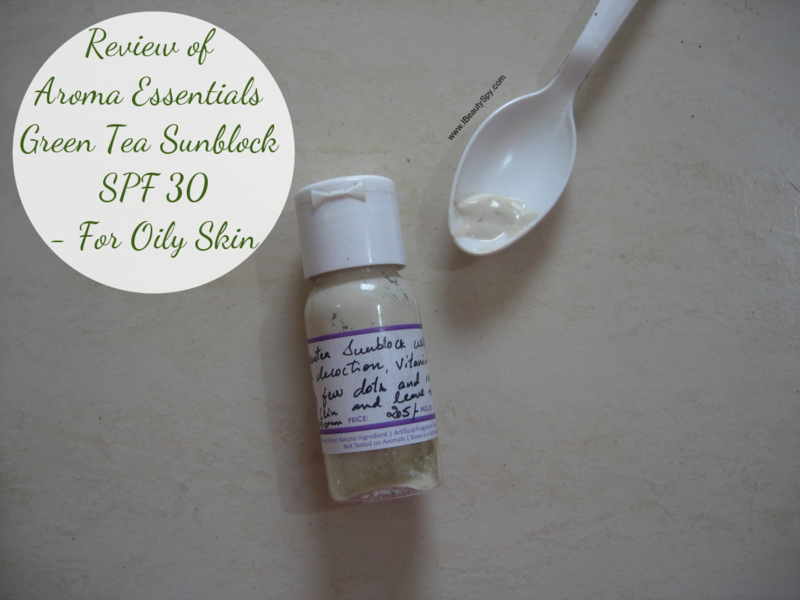 Let’s begin review of Aroma Essentials Green Tea Sunblock SPF 30. Green tea is really so good for your skin. It is rich in antioxidants and help prevent acne. 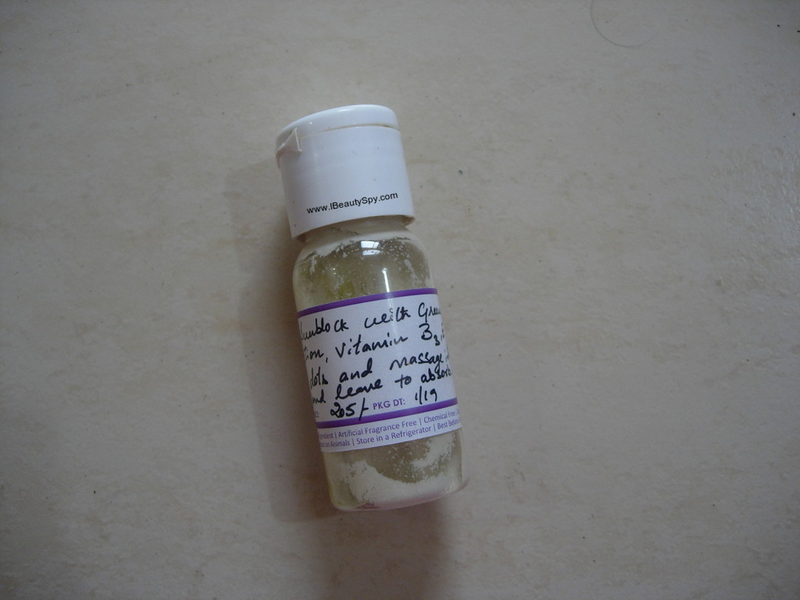 I have seen many skincare products containing green tea – face packs, toners, face washes. But this is the first time am seeing a green tea sunscreen 😀. Awesome! When Aroma Essentials had posted the new launch on Insta, I was immediately intrigued. And I was so happy when I received the same for testing by the brand. Aroma Essentials Green Tea Sunblock is off-white in color and has a runny, lotion-like consistency. Due to this lotion like texture, you can apply it on your hands and feet too. Previously, I had tried Carrot and Tomato sunblock from the brand and they were thick, cream based. I could use them only on the face and I once mentioned to the brand about introducing sunscreen lotions to be used for body. So this one is perfect to be used on body as well. 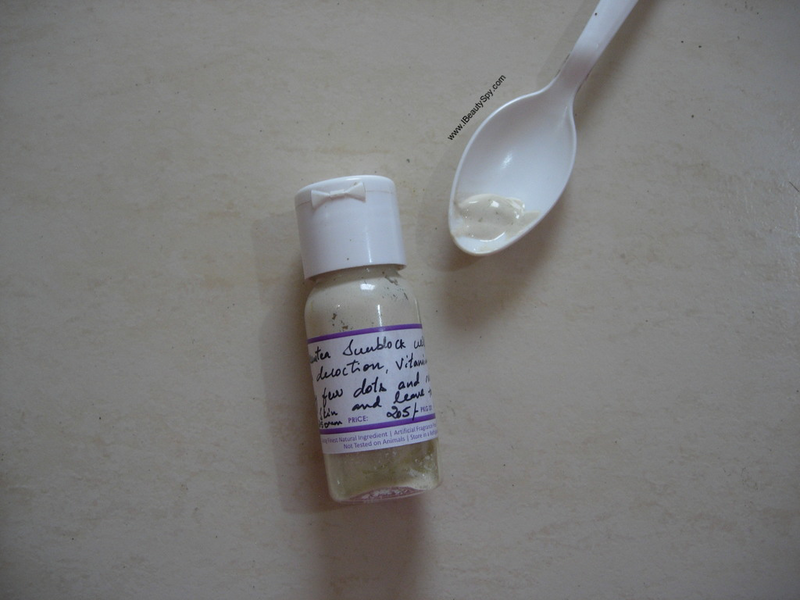 It has a refreshing scent of green tea with some essential oils. Aroma Essentials Green Tea Sunblock is light-weight and gets absorbed easily. There is no white cast. It doesn’t feel heavy on the skin or feel greasy. The runny and light consistency of the sunscreen is perfect for summers. You won’t sweat extra and face doesn’t become shiny due to applying this which is the case with most sunscreens. It gives a matte finish actually. I would advise you to apply aloe vera gel or a light moisturizer under it as this doesn’t have any moisturizing effect. There is also a light brightening effect after applying. Aroma Essentials Green Tea Sunblock offers good sun protection and is excellent in preventing tan. I have sun-sensitive skin and get tanned very easily. Most of the sunscreens, inspite of having high SPF didn’t prevent my tanning. But when I used this sunblock, I was astonished. My tan was reduced by 50-60%. Apart from protecting you from sun, you also get the antioxidant benefits of green tea. I didn’t get any acne or breakouts when using this. It also reduces pore size. 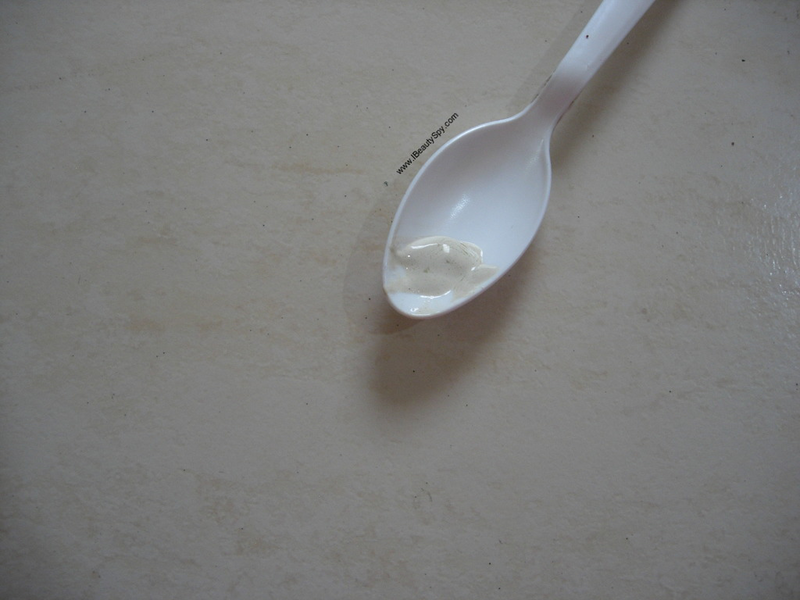 * Light, runny lotion-like consistency which gets absorbed easily. * Doesn’t leave any white cast. * Doesn’t make you sweat more or make face shiny. * Provides a matte finish. * Skin looks brightened on applying. * Excellent protection from tanning. * The addition of green tea helps prevent acne and minimizes pores. * Refreshing scent of green tea. Yes, I already ordered two more bottles. Aroma Essentials Green Tea Sunblock is a splendid sun care product that you should definitely try out this summer. It has the perfect light consistency for a sunscreen. It prevents tanning to a great extent which is the biggest problem in summers. Green tea provides the much required antioxidants for your skin. I would definitely recommend this sunblock for all skin types. Really this aroma essential green tea is very effective for my sensitive skin.